What can we say or do to adequately express our heartfelt “thank you” to those who paid the ultimate price defending the freedoms that we all too often take for granted? Many traditions have begun through the years. 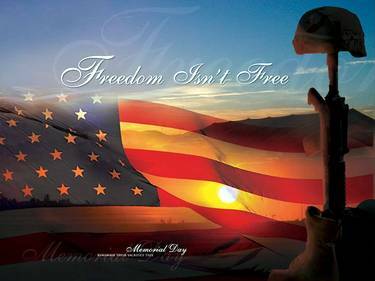 Some honor the fallen with parades, ceremonies at cemeteries, and at various other events. The traditional Memorial Day flag ceremony includes briskly raising the US Flag to the top of the pole in the morning, then slowly lowering the flag to half-staff where it flies until noon. The flag is then slowly and ceremoniously lowered at the end of the day and removed. This ceremony is performed by living soldiers as a sign of their intention to carry on the good fight so that the ultimate sacrifices of the fallen will not be in vain. For the second consecutive year, NASCAR will honor our troops this Memorial Day Weekend with “600 Miles of Remembrance”. During this race, the sport pays tribute to our brave service men and women. In a typical NASCAR race, each car displays the driver's name on the windshield header. Yet, during this special race, each car will bear the name of a fallen service member instead. In the late 1990s, many radio and television stations began playing “Taps” at 3:00 PM each Memorial Day while many Americans paused for a moment of silence to remember those who lost their lives defending ours. In 2000, the US Congress passed the National Moment of Remembrance Act to officially recognize this tradition. Yet, even though all this still doesn't begin to pay the debt we owe to our fallen soldiers, we must continue to do all we can to express our gratitude. Today, let's do more than just pause for a moment of silence. Let's attempt to say “thank you” in any way we can to the families of the fallen, and to those who continue to serve our country and defend our freedoms. God Bless our Troops!